Training Weights(Attribute,100 Experience Points) If the User Removes Weights, Slot 1 of the item is Increased by 1 Square and Slot 2's Duration is decreased by 2 turns for the next 5 turns. External Damage (Passive,25 EXP to Learn) All Taijutsu Gain: Bruise for 1 Turn. After-Image(50 Stamina,25 EXP to learn) Dodge One Technique,Select one Effect:One Maneuver on this turn is increased by 1 or One taijutsu this Turn gains: Move-Range:1. Swiftness(25 Stamina,Passive,100 EXP to learn)All Maneuvers used for This/Next Turn cost -1 MP and can move up to an extra 2 Squares.Once every 5 Turns. Swift Strikes (Attribute,125 Experience to Learn) Lower Leveled Opponent's Downgrade Abilities do not Affect User's Taijutsu. Indestructible Force(150 Stamina,passive) One Taijutsu Shield may Shield against Inevitables,Twice Per Battle. Crippling Strike (50 Stamina,Passive) Selected Taijutsu Gains: Bruise for 2 Turns. Offensive Leap (25+## Stamina,Passive) Adds: Move-Range:1 To One Taijutsu Skill. May Increase Range by 1 per 25 Chakra. Max of Move-Range:3. Once every 2 turns. First Gate:Gate of Opening (25 Life,500 EXP to learn) Regain 50 Stamina and 25 Chakra every three turns. The player is not affected by Debuffing Techniques that Debuff 100 or lower. Once per battle. Hot-Blooded (Attribute,500 Experience Points to Learn) User's Taijutsu gains +50 Life Damage. Opponent's Taijutsu Holds are reduced by 1 Turn. Cannot Reduce Below 1 Turn. Tremendous Force(100 Stamina,Passive) Selected Taijutsu Gains:+200 Life Damage and Bruise for 4 Turns. 4 Times Per Battle. Footwork (Attribute,250 Experience to Learn) Dodge/Avoid Taijutsu may defend an additional Taijutsu Skill. Second Gate:Gate of Rest (50 Life,500 EXP to learn) Restores 200 Life/Chakra and 250 Stamina.Refills MP and any limited Taijutus techniques used in the last two turns. Once per battle. Spirit Sensor(250 EXP to Learn,150 Stamina) Senses Camouflaged Opponents while Disabling Blind on the User. Sensor Range:2. Muscle Memory(250 EXP to Learn,Attribute) User may use D/C Ranked Taijutsu and Defensive Taijutsu while Held/Immobilized in a Taijutsu/Ninjutsu Hold. Inhumane Speed(150 Stamina,passive,300 Experience To Learn)Upgrades the next Avoiding Technique the User uses. Twice per battle. Third Gate:Gate of Life (75 Life,500 EXP to learn) All Taijutsu Deal 100 more Damage for the rest of the battle.All Taijutsu Gain Cant Dodge, while Opponent's Techniques are Downgraded from Can't Dodge. The Damage Increase Surpasses the Damage Max. Bruise Effect:Next Taijutsu Hit Gains:+25 Life/Stamina Damage. Taijutsu Effect Boost:Fracture Handsign/Slow Effects increase by 1 Turn. Enfeeble/Impair are increased by +75. 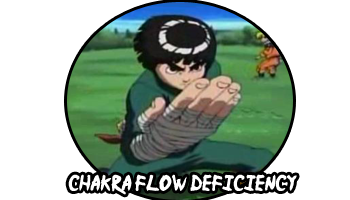 Chakra Deficiency Owners cannot learn Ninjutsu or Taijutsu unless specified. Recoiling Strikes Note: If the Previous Taijutsu was dodged, The Next Taijutsu gains Cant Dodge. If it becomes inevitable, the Added effect also gains "by Skills costing 50 Energy or Lower".